When you think about the news coverage you are seeing on a daily basis, it seems so natural. Rarely, do we stop and actually analyze the type of content we are receiving. From the time we are kids it is ingrained in us like a hereditary trait. We see the message, receive the message interpret the message. News is news is news. But, where did that message come from? What is the context of that message? Who is behind the curtain of that message? Recently, is has become quite apparent that the sources of our news belong to an overwhelming, white majority. 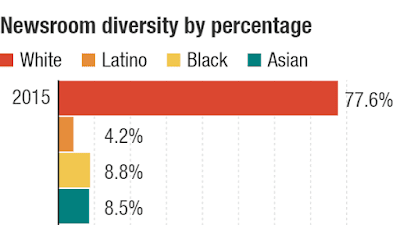 As a result, there is a distinguishable lack of coverage when it comes to issues in the minority communities. So, whose to blame? 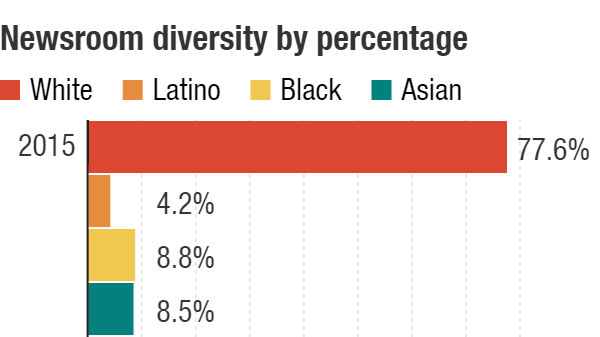 NPR 2015 Office Diversity Percentages. https://www.npr.org. According to an article read in class, "Why Newsroom Diversity Works: effective strategies for making newsrooms more inclusive", New York Times reporter Nikole Hannah-Jones points the finger at top management. Hannah-Jones explains that news heads have been hiding behind the excuse that the country is changing, and minority issues have suddenly become more relevant to report on. The issues have not changed, they have just garnered a greater voice, a voice that must be recognized inside the newsroom through diversity. Hannah-Jones and CNN reporter Tanzina Vega went on CNN to discuss the issues of race and diversity in the newsroom. She brings up the idea that, among journalists, race tends to be seen as a trend rather than something people live every day. In order for these minority issues to be properly covered in the news, newsrooms have to hire minorities who have an everyday background with these issues.